In this section, we take you on a typical journey with us. Going through every single step it takes to complete a project, in order to prepare you to the exciting process that a new building or a remodeling project is. A new home, a remodeling, or any other architectural work, is an exciting event in which we strive to create the dream you envision. However, like any other project, outlining the process will help you understand what is going on during each step of the project, and will allow us to better meet your expectations. 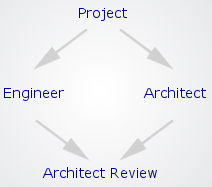 Any project with us is a team work effort where you will be involved, and play a significant role. Good communication between all parties involved will be a key element to a smooth project. Our team work relies on good interactions between You, our team and the builder that you have selected. The better the quality of communication between all of us, the smoother the process will be, and the quicker the project will be completed. The goal of the first meeting is to meet with you and determine what your goals and wishes are. It is very important because it will set the scope of the project, and will help us better understand what your expectations are. We want to know everything that you wish, and see if we can do it. We want to know what your budget is, so that we can come up with a realistic and workable plan in which you will be confortable going forward with. - and whether the budget will be enough to create the artwork. Artwork is a detailed mockup drawing of what the completed project would look like, and is required so that all of us - You, the architect and the builder - can see where the project is going, and whether	it matches your expectations. At this point in time, you are under no obligation to use our services. However, because creating the artwork entails a significant amount of work, we do require that artwork is paid for separately; and its cost should be included in your project's overall budget. After you have approved of the artwork and are willing to use our services, the architect will set up the agreement, which is a comprehensive contractual document describing the work to perform, and send it to you. The agreement is a legal document, and describes X, Y and Z. Usually, we will exchange the agreement back and forth a few times until both parties, you and us, agree to all parts of it. 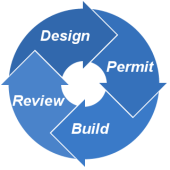 Now that the agreement has been accepted, the work can start, and the Design Loop stage is initiated. With good communication, there shouldn't be more than 2 or 3 change loops. Each time a change is required, the architect and the designer will have to alter the artwork, which translates time and cost into your project. Now that the design has been agreed upon, the project will be split between the structural engineer and the architect, and then reviewed and refined as a whole by the architect. Now that the engineer has calculated the structure and that the architect has reviewed and refined the blue prints, the project needs to go to the city for approval and get a Ready Status permit. One that all clarifications	and refinements have been submitted to the City and the final drawings have been approved by the city Plan Check department, then a Ready Status Permit will be issued. At this stage, the project has a valid permit from the City, therefore contractors can bid and you can accept their bids. This is where you have to pick and choose a contractor/builder to start the job. As the contractor/builder that you have chosen carries out the work, the architect will monitor the job but won't supervise it, instead, the architect will observ the progress and report to you whether it is going well, or whether some unwelcome modifications have occured. During this stage, it is important that you check the work on a regular basis to assess of the progress by yourself. At multiple points during construction, it occurs that an inspection by a city official is needed to ensure that the building complies with the city's current building codes. These routine inspections can sometimes lead to minor delays and modifications of the plan, but rarely impair the advancement of the project as a whole. Once the contractor has finished his job, there will be a final inspection by a city official, a final observation by the architect, and if you are satisfied by the contractor/builder work, then you will sign off, and we will look forward to working with you again in the future.